Today I am a guest blogger!
. My craft tutorial on 'How-To Upcycle a Jar to Store Craft Supplies' is featured. I am so excited (and nervous) to have a tutorial I put together, on one of my favourite blogs! It is a real privilege, I just hope I don't cramp the blog's gorgeous style. Joanna's blog is full of craft diy's, reviews and updates on her lovely shops on Etsy and Not on the Highstreet. I particularly enjoyed her 'Starting an Online Shop Series' which has covered; research, pricing, photography, feedback and networking. I am hoping to open my own online shop soon, and the posts have been so helpful in my preparation. If you would like to see my how-to or would like to see a lovely blog, pop on over to Adventures and Tea Parties for a browse. Thanks so much Joanna for the opportunity, I hope I can have another diy featured on your blog again soon. Have a wonderful day everyone! A slice of cake in the post! It took me a little while to figure out how I was going to do it. I wanted to be able to open it up and write a message inside, so this is the design I settled on. I used a medium weight white card and just some ordinary colouring pencils and a white pen to draw the details. This is how the cake card looked closed up in its envelope. Hopefully my friend will have some real cake available to eat in case the card makes her feel hungry. Hmm, I'm feeling a bit peckish myself now. Cake anyone? With the mail art kit I also put in some suggestions (see below) for decorating mail. I often draw things instead of writing them down. Am I the only one who does that? Anyway, I thought I would put together another mail art kit soon but this time to giveaway on this blog, so watch this space! 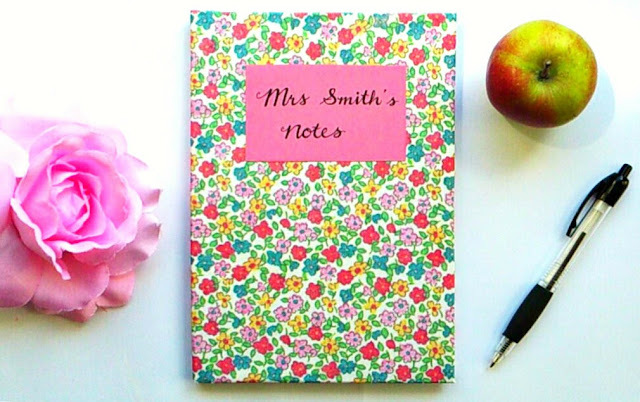 1) Personalised covered notebook: I simply covered a £1 notebook in pretty decorative paper that I already had from Hobbycraft. See below for the how-to. By adding a handwritten label with the teachers name/message it becomes a very personal and useful gift. If you don't have any decorative paper or gift wrap you can also use brown parcel wrap which your child can decorate. 2) Lavender sachets: Such a cute gift. I made the sachets shown above in the shape of an apple by making an apple shape template. See my previous post on lavender sachets for a how-to. The only differences with these ones were that I didn't use ribbon for hanging them and I added a stalk. I made the stalk from a small rectangle of brown felt that I rolled, sewed up and inserted inside the top (into a small opening that had been left unsewn in order for it to be turned the right way out) before closing up. A name or initials can also be embroidered onto the front. 3) Hand painted mug: Another gift you can personalise with a message to the teacher. These hand painting mug kits can be purchased online through Amazon and EBay. Wilkinson stores often have them stocked to. Always follow the instructions that come with the mug on how to set the paint (it is usually done in the oven or microwave). You could put a pack of biscuits in the mug for an extra treat! 4) Personalised keyring: The keyrings in the photo were bought in a pack of ten from Hobbycraft and I have used them a lot in the past for children's party bags etc. All you have to do is insert a rectangle of paper which you have decorated into the front piece of the plastic keyring then seal it with the back piece. Children can put in a little drawing or message for their teacher. I love them! If your child is too young to write you can write the name and message yourself. 5) Gift wrapped chocolate: O.k, I know chocolate is predictable but seriously who doesn't like chocolate? I have a family member who works in a school and her cupboards are always full with boxes of chocolate that she has been given at work. I am always very jealous when I see her stash. Instead of buying a box of one of the usual brands though why not make your own box of chocolates. All you need is chocolate and a mould. I used a silicone ice tray that makes apple shapes, purchased from EBay. You just need to melt the chocolate, fill the moulds with the melted chocolate then wait for it to set (put in the fridge for quick setting). Wrap them in a box or even some baking paper tied with twine, easy! All you need is; a notebook, decorative paper, scissors, glue, a pen and a label (or piece of paper). 1) Use your notebook as a template and add an extra cenitimetre or so for folding over the edge. (Note that when the notebook is closed more paper is stretched so measure with the book nearly closed to get an accurate size). Cut the corners on the decorative paper template that you have cut out. 2) I cut the paper at the binding part into a small rectangle tab. 3) Insert the tab (glued) into the hollow part of the binding. If you notebook doesn't have this type of binding it might be easier to just cut the paper along the edge of where the paper is bound. 4) Fold over and glue down edges of the decorative paper. 5) Add your label to the front cover. 6) Optional: if your paper is quite thin you could apply sticky back plastic (the stuff you use to cover school exercise books) to prevent the possibility of the paper ripping. Just apply it on top of the paper cover leaving an extra margin to fold over the edge. If you don't have much time try this instead. It is basically a book sleeve for your notebook. Use your notebook again as a template. This time though leave no extra paper at the top and bottom to overlap, instead make the paper an equal height to the notebook. Then make the sides much wider so that when folded over the sides of the cover the edges almost meet the center where the pages are bound. Finally glue the side edges down. The book 'Creative Lettering' showcases the individual styles of a number of different creative lettering artists. Instructions are given on how to replicate their style along with the tools they use to produce it. The tools that were listed were not what I had been expected. I had thought, for some reason that all the artists would use expensive, difficult to find calligraphy fountain pens. I was surprised to find, however, that the majority of the writing styles where achieved with just a simple black fine-point marker pen which can be found in most stationery shops and are quite affordable. Examples of the artists work is also shown throughout the book, providing ample inspiration and ideas to burrow. 'Creative Lettering' has introduced me to a few artists whose work I've discovered that I like, but may have not have come across otherwise. There are links to the artists website/blog/shop, so if you want to see more of their individual work you can do so through their online sources. One of my favourite styles in the book is by Aimee Dolich above. I love the bright colours behind the black font, it is so eye catching. Aimee sells a number of items with her creative lettering style online; including prints and washi tape. Rhianna Wurmans style of mixed up lettering styles and doodling that she used in the 'favourite word' piece below would look great in a poster design or a journal. I have plans to incorporate some of my own 'favourite words' into my mail art in the future as I think it looks really effective. I also thought this writing style above by Lori Vliegen was very pleasing to look at. I had a little practice with just an ordinary Biro pen and really liked the results, and I think I will use it often. Lori's work is lovely. You can take an online class by her if you want to learn her style of writing in more depth, which I might actually do. Included in the book are also some alternative creative lettering techniques using different mediums such confetti, masking fluid and Lego. Overall, I was very pleased with the purchase of the book and would rcommend it. I can see myself picking it up to browse often. Since I started reading it I am not only paying more attention to my writing style but I am also noticing creative lettering styles more everywhere (shop signs/posters and in magazines etc). The only way I think the book could have been improved would be by having some practice sheets included with faint outlines of the styles to help you get started. I felt a bit perplexed in the beginning at how to start. The instructions are clear but I am the type of person who usually skips reading any instructions to get straight into doing, wanting instant results. I have to concede though that creative lettering is one of those things that just takes a bit of patience and practice. If you like creative lettering or just want to improve your own handwriting however, it is worth investing the time as the results are very worthwhile.